Discussion in 'Concepts and Ideations' started by GuilleAcoustic, Feb 2, 2016. Note: This thread is going to evolve a lot, so please see it as a living thread. I'll maintain and update this very first post to keep things clean and tidy. Also, please excuse the beta state of this front page. I haven't found any "draft" mode and I didn't want to lose anything to a power cut or firefox crash. I'll quickly make this clean and documented. Well, first of all, this must be read microTopia but using the greek character µ makes it look more like Utopia. µTopia is a persistent autonomous world. Autonomous is the way that you can't control any of its inhabitant, could they be children, women, dragons, etc. They will live their own live and make their own choice. µTopia is a digital world housed on a cluster. The aim is to enable heterogenous architecture, could it be ARM, x86, MIPS, etc. Once started, the world will evolve on its own, civilizations will grow or disappear, there will be transactions or wars between cities. You are a God, and as such you can affect the world itself. Casting disasters or granting your benediction to your beloved people. Maybe a Hero will arise somewhere and you'll have to design his/her stats and skills. µTopia is the digital part of the project. As mention, it will work on a cluster that will itself need a dress. You are a God and deserves a nice place to live in. People who know me also know how much I do love monolithic chassis design: Monolith + house = Tower. Tower of God is the name I choosed for the cluster chassis. Won't it be too big ? I'm aiming at pico-ITX size motherboard. Ther are plenty of choice in this form foactor (x86, ARM, etc.) and will give a great size / performance ratio. Anything below pico-ITX will fit too (Raspberry, Odroid, Jaguar, Pine64, etc.). As mentioned, everything will be accessible from a Web UI (world status, detailed status, godly events, etc.) This is your place, the domain of a god ! Biowarejak, Colinreay, craigbru and 3 others like this. Interesting idea, do you have any plans what kind of language to program the backend in and what sort of style you'll be pursuing for the UI? Or is this all in really early concept phase? Thanks a lot. Backend will be C++, as this is my language of choice. Thinking about LUA or Python for scripting. what sort of style you'll be pursuing for the UI? Or is this all in really early concept phase? While the idea of the distributed "game of life" is not new, the UI is a very early concept and features like "Heroes", "God" and RPG rules are less than 24h old. I was going for text mode only at the beginning, like an advanced game of life, but thought it could go way further. Posting things here helps me to keep motivation high while having feedbacks. I increased my RAM recently to create a virtual cluster until the I have Tower of God running. This is quite interesting. Have you also considered using Erlang or Elixir as well for the backend? Sorry for the lack of updates, had serious health issues and lacked time for that. A new idea matured and merged with the utopia project. You'll be exploring this randomly generated world, gathering materials to then craft tools or build your house. Unlike Minecraft, this won't be based on big cubed. Being able to sudivide big voxels can lead to awesome graphics. About mining, instead of harvesting cudes, you gather fragment. A fragment is the smallest size a voxel can be. You can then use a machine to fuse those fragments into tools, fabric, materials, etc. Kinds like a 3D printer. I'd love a real trading system, unlike what Minecraft and the likes provides. The feature is something I have in mind ever since I used redstone in MC. Imagine you could house a full logic (logic gates, compators, timers, etc) inside a box, connect sensors (light, movement, buttons) to its input and actuators (led, motor, piston) to its output. Now imagine you could use gears, pistons, chains etc ... What would you built ? Transport ? Traps ? Fighting will be based upon RPG rules using your attributes. I'd like tto make a dumb-mobs less game. I wish I could see monsters attacking me with a strategy, ambushing me, feeling than be hunted. Biomes, each of them with their own fauna and flora. Day & night cycles, maybe it'll have effects on people or animals. Weather like rain, snow, sand storm, etc. 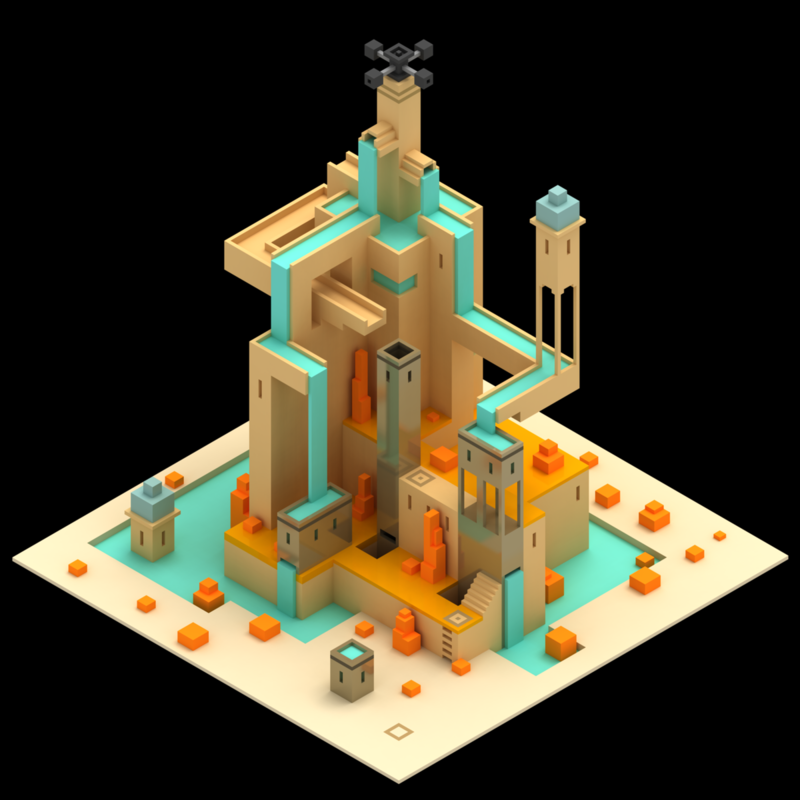 Constructions, like village, dungeons or lost civilizations. Something I'd love would be a constantly evolving world. Climates could change, NPC could be decimated by a Troll. That would, of course, only concerns area that have been discovered. The whole code MUST be modular and extensible. Heavy use of threads when possible. This is where I'm at the moment. Typing it on a phone is a nightmare, but I wanted to share this with you. Edit: I'm opened to any comments, positive or not, as long as it is constructive. By the way, I thought I could call it "A Voxel Story"
Colinreay, NRG, Phuncz and 2 others like this. I'm going for a daily update, as it forces me to move forward. This thread will live until I reach a stable state. Then I'll make a more professional dedicated thread. Please feel free to make any argumented comments, positive or not, as it helps me to improve myself. Note: Please excuse this poor map, still a rookie. This is the core of the game. It stores the world data and send them to the clients or engines. Engines are responsible of all calculations. They can run on the Data server or on a dedicated machine (x86, ARM, etc). Fluids and Newtonian speak for themselves. I've always been frustrated by redstone limitations in Minecraft. Coding ? Yup, coding, in-game scripting capabilities ! This is the game master. You might find treasure or you shall not pass ! Note: I mentioned RPG and skills in the previous post. I'll explain this in details later, but their will be a world history generator. Been a classic paper & dices RPG player as well as a Warhammer game master for 20 years. Time to put that experience to fruition! 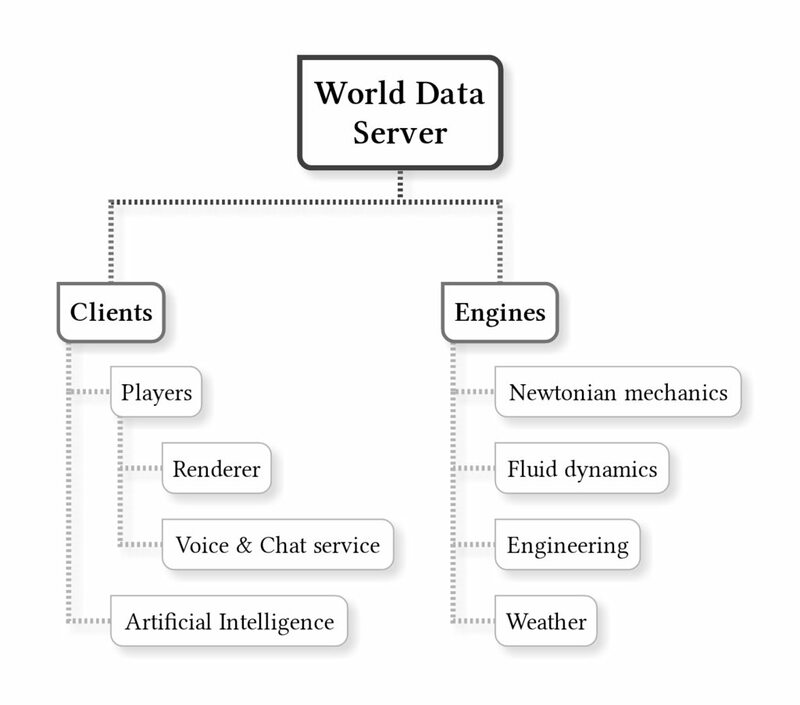 Player will enjoy the game thanks to a client, which will receive data from the "World data server" and send information's to it (actions, etc). Artificial intelligence ... Through a client ? Yes, that's no typo ! As I envision it, you could run an headless client to manage villagers, enemies, NPCs, transports & machines. That king of client can run on the data server or on a dedicated host. This is an attempt to release some load from the data server. This is also a good opportunity to reuse all your Raspberries that are lying here and there. The server would also keep living while you're away, maybe a village will have its inhabitants turned into zombies because you were too lazy to repair the fortifications. Colinreay and Phuncz like this. I renamed this thread into "The GuilleAcoustic's Game Design thread" as this is more accurate. Note: This applies to villagers, allies and ennemies. 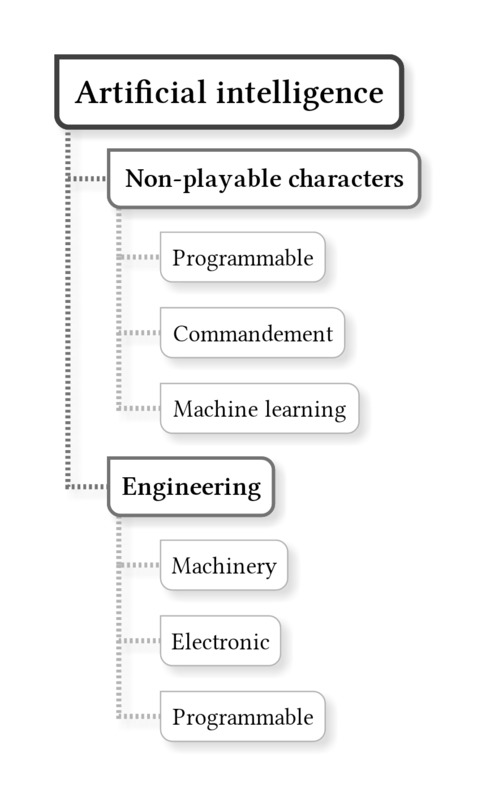 By programmable, I mean in a graphical way. Note: This is solely for allies like mercenaries, but in a way is the basis behind the scripted AI. This, of course, in not available on unique characters. Those will have their own intelligence. This applies to organised groups only, allies or ennemies. The leader of a group can give order to its troups. This works the same than the "programmable" feature, it overwrites the scripted AI with new rules depending on the situation. Troups under the influence of "commandement" will have penalties once its leader has been killed. This is quite a big one, but in my opinion an AI should be able to learn. For example, it could analyse your attack pattern and foresee your attacks if you repeat them too much. This is the mechanics engine mostly, responsible of gears, sensors, motors, pistons, etc. 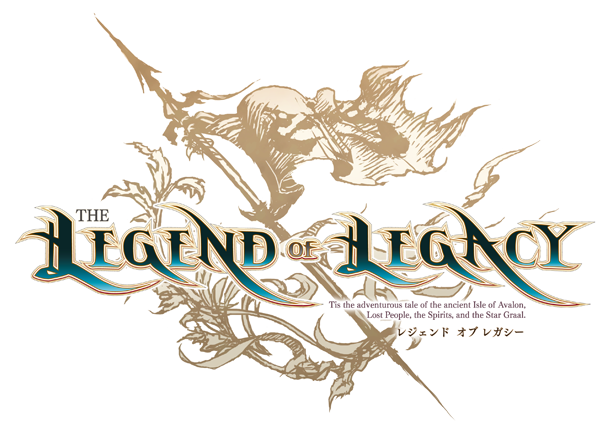 Again, similar to the two above but with in-game programmation. Ultimately, the three of them could be combined in a single system. Only addition is the building system that will allow to make structure models (stairs, columns, roof, house, etc), then have a slave / drone build it. I'm adding the advanced rules here. This will impact how silent you are when hunting / spying, how talented you are when doing artisanat, how fast you swim / climb, etc. Alse adding alignment. You are neither good or evil, only your actions will reflect your personnality. Alignment will influence how you interact with others. Acts in accordance to your god rules and you may have a bonus. Act against them and you may be punished. Added mythologies, religions and background story. Background story is a randomly generated history of the world. It does include lost civilizations. Mythologies are based on our ancient myth (Nordics, Gilgamesh, Egyptians, Mayans, etc). Each civilization is based on a mythology. This will influence buildings, monsters, etc. Religions affects people actions. They are not based on current religions. Still the same modular, cross-platform, distributed and scriptable approach. I'd also like everyone's opinion on possible mini-games. Do you think it is a good idea to add ingame mini-games ? Update: last update before the prototype. The data server will generate the world from a well known 3d math formula, thus I can easily verify that the data received are ok. The client will use an old graphic engine I started just before my first daughter's birth ... Never finished it of course. The camera model works though, which is all I need at this step. A basic AI will be added as a second step, only following the player at a slower speed. Multiplayer as a last step to validate that the server can send data to several clients. No engines nor world edition at this stage. All connections are made over SSH. 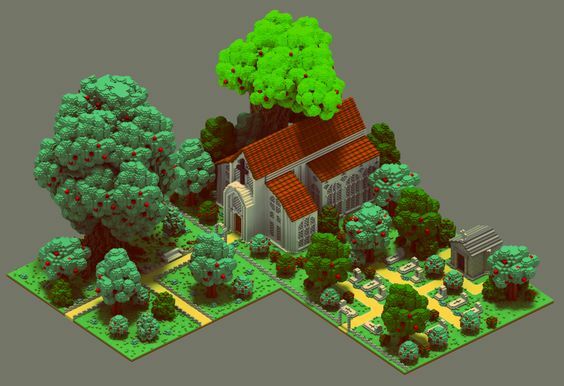 This is the last post about A Voxel Story in this thread. I'll create a dedicated thread once the prototype can be showed. This thread is just a game ideas dump of mine, lol. Important: can you please answer to the poll ? Thanks. Note: my rendering engine was called Valhal engine, in reference to the Valhalla. It was supposed to power a Nordics mythology based RPG. Soul_Est, Aibohphobia and Phuncz like this. Phuncz, iFreilicht and robbee like this. I agree! With the right shading, it looks beautiful. The examples on that github are really nice as well!